Pork curry is a specialty dish for Christians and there are several methods of preparing this classic dish. Pork Pepper Fry, Vindaloo, Pork chilly Fry, Pork with Koorkka, Pork/ Beef with Kaya -are all favourite pork dishes in my family. All my family members, except my mom love Pork curry and although my mom never ate Pork, she would cook Pork deliciously. 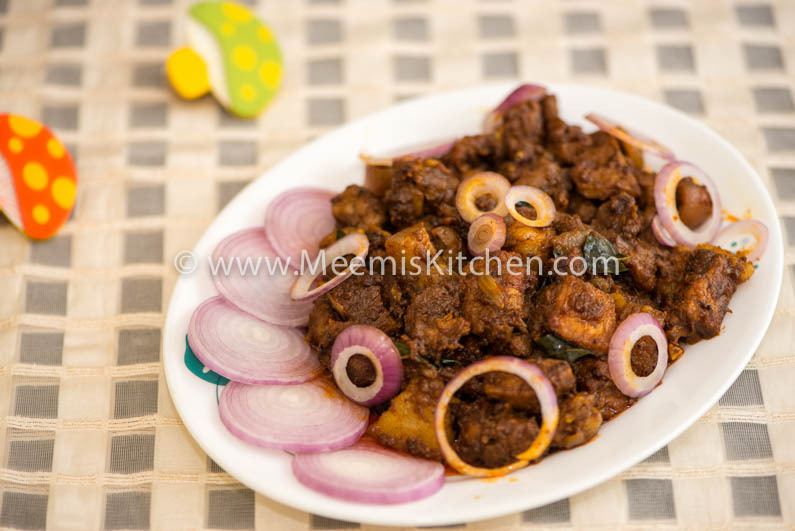 At my home, this Kerala Pork Puralan is made during festival occasions and whenever you feel like cooking something nice and special for lunch. Although I loved Pork curry during my childhood, there was a time when I stopped eating Pork curry (influenced by my mom and sis), and so, I never bothered to try Pork dishes until recently. For our family gatherings, my cousin, Linda always makes yummy Pork dishes. My kids and hubby loved it… so I decided to try and make it at home. There are many Pork curry recipes, the one with Koorkka (Chinese Potato) is what I like most. Since, Koorka was not available, I settled for this recipe of Pork curry, because it is delicious, easy to prepare and with simple ingredients. It will be good if you could get some fatty cut of Pork, and you could use the same fat for roasting. I am very conscious about the volume of oil/ fat that goes into my dishes, and if you go through my dishes, you will be able to see how stingy I am when it comes to the oil part. But, with Pork and Duck Roast, although I remove a fair amount of fat from the top, I am less stringent. The fat gives the dishes the taste and indulging once in a while is fine, I guess!! Here is the delicious and simple Pork Curryt recipe for all the Pork lovers, specially dedicated to my darling chittappa, Bejoychayan. Big Onion : 2 nos. Shallots/ Small Onion : 4 -5 nos. Clean and wash Pork pieces. Squeeze the water and drain. Heat oil (preferably coconut oil) in a pressure cooker, pop mustards and add the sliced onions and sauté till pale. Add the ginger garlic paste and fry for some time. 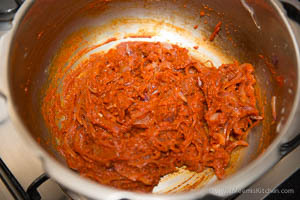 Grind the ingredients for masala paste (add 1 tbsp water) and add this fine paste to the onion and fry well for some time. Add the Pork and salt and mix well. Cover and cook till done. (Pork and beef take almost the same time, pork can be cooked for a little more time). I kept for 8-10 minutes. If there is excess fat, keep two tbsp. fat. (Discard some fat, if there is too much fat and keep the fat to a minimum level). Heat the Pork fat in a Pan, add the sliced shallots, garlic and curry leaves and then add the pepper and Garam Masala powders. 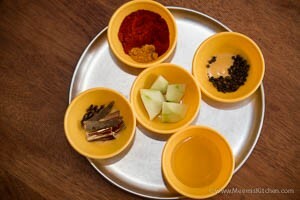 (1/4 tsp each or more). Mix the Pork and roast till the gravy coats the pork pieces and starts drying. Serve hot with rice, kappa, Appam or Bread. Please adjust the spices as per your spice level. Papaya pieces makes the meat tender. You can use whole Kashmiri chilies instead of powder for more authentic taste. The pork should be roasted in Pork fat (take from top, after cooking) to avoid more oil and also to enhance the taste. 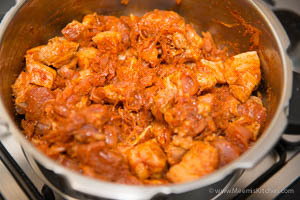 Always buy a fatty cut of Pork for roasting and vindaloo, as the fat enhances the taste. If you like this recipe, please share using the buttons on the side and let me know through comments. God Bless! !